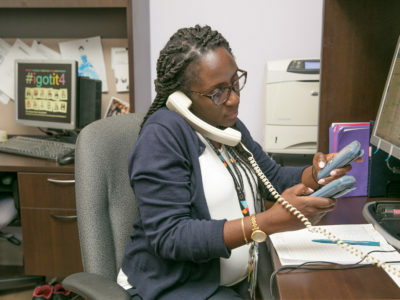 Nana Asomaning has been working at Mount Sinai emergency department for the last 7 years. She was the second GEM nurse at in the Sinai ED. 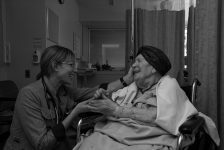 She is an important part of the evolution of Mount Sinai Senior-Friendly Emergency Department initiative. Here is her story. The first time Nana heard about geriatric emergency medicine was by her formal boss when she was transitioning to acute care in medicine. “I wanted something more challenging”. Nana prefers working with chronic conditions patients and complicated discharge planning. Geriatrics became the perfect fit for her. She organized most of her Masters courses on geriatric topics or subjects that could be applied in an older adult population. She also took a falls clinic course, where she learned how to do a comprehensive geriatric assessment independently. The remaining of her training was gained by experience and relationships with other professionals. Her role is very broad in the emergency medicine. In the Mount Sinai ED, we often describe the role of GEM Nurse as 50% clinical and 50% for capacity building. People often assume that all she does is discharge planning. It is a significant bulk of her clinical component. But in order to get to an appropriate disposition plan she works with families, she reviews a lot of the geriatric syndromes, she collaborates with the emergency team, their family doctors, the community resources, etc. Sometimes, the best disposition for older adult patients is admission to hospital and her role is to advocate for them. “It is not all about avoiding admission, it is about advocating for the right care, at the right place, at the right moment”. By digging deeper into the life of our geriatric patients, Nana is able to change everything for the best. “Major social issues or geriatric syndromes may not be recognizable in an cute care setting and the reason why they are in the ED may seem benign but there are all the other factors that may impact their ability to recover and will have a direct effect on the disposition plan”. The other part of the role is the capacity building. 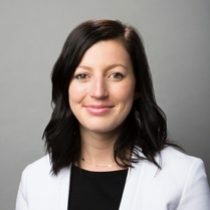 She works locally with the emergency department to build policies and protocols, to coordinate the staff training around geriatric syndrome and she try to integrate geriatric into as many care processes as possible. “We believe that geriatric care is good care for all”. For example it is incorporated into the primary nurse assessment, pre-printed order set for hold overnight, delirium and other tools. “The tools are there to be used but ultimately it builds a culture of geriatric care in the department”. She attends a lot of committees and conference, present to conference about the work she does and how to manage geriatric syndrome in the ED. The GEM nurse is part of the interdisciplinary team and often acts as the team lead. “We have all our roles and a tons of overlap but the GEM nurse has a little bit of every role and is good at seeing all the pieces and bringing them all together. But our team philosophy is not about leadership, it is about problem resolution”. I asked Nana what impact does she think she has on the patient’s life. 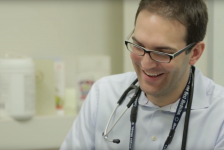 “I think that older adults like the attention that they get from the GEM nurse just because of the nature of the ED and the health care system. We asked them questions and dive into things that they were never asked before. I think they appreciate that. As an interdisciplinary team we contribute to increase the length of stay at home, we help to build the care plan in the community and sometimes just to identify their concerns and needs. My first priority is this marginalized and complicated population”. “Today, there is this guy who came in for a fall. He said that he tripped on a sweater on the floor. Nothing is broken, he walks, eats, drinks and talks. No identified cognitive red flag. This is his version of the story. I called his family doctor, the manager of his building and some family and friends I quickly realized that the story is much more bigger than a simple fall. It turns out that he is falling a lot in the last couple of months because of back pain (barely treated), his prostate cancer treatment and a recent lobectomy followed by a geripsychiatrist in the community. The original plan was to send him back home, but the new plan is to integrate a physiotherapist by the CCAC, a PSW, standing Tylenol in his blister pack, and sending him home with the program “Home at last” and a follow up with his family doctor. We may have prevented further falls with more severe consequences and probably increased his quality of life”. The GEM nurse is a crucial component of a senior-friendly emergency department. Her role is broad and her impact significant. In the future, Nana would like a better integration of the GEM nurse in the community and in outpatient clinics. For example, a geriatric clinic leaded by GEM nurses, coordinated by a geriatrician would probably improve access to appropriate geriatric care and increase the follow up possibilities. It would also help building stronger clinical skills and competencies. “This would be a very cool way to bridge the gap”. Désy PM, Prohaska TR. 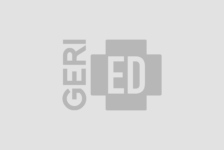 The Geriatric Emergency Nursing Education (GENE) course: an evaluation. J Emerg Nurs. 2008;34: 396-402. Carpenter CR, Griffey RT, Stark S, et al. Physician and Nurse Acceptance of Geriatric Technicians to Screen for Geriatric Syndromes in the Emergency Department. West J Emerg Med. 2011;12: 489-495. Basic D, Conforti DA. A prospective, randomised controlled trial of an aged care nurse intervention within the Emergency Department. Aust Health Rev. 2005;29: 51-59. Corbett HM, Lim WK, Davis SJ, et al. Care coordination in the Emergency Department: improving outcomes for older patients. Aust Health Rev. 2005;29: 43-50. Hegney D, Buikstra E, Chamberlain C, et al. Nurse discharge planning in the emergency department: a Toowoomba, Australia, study. J Clin Nurs. 2006;15: 1033-1044.